Preventing tooth decay is one of the primary goals of the professional dental services provided at Signature Smiles. Our general dentistry services enable us to monitor oral health to look for signs of tooth decay and stop it in its tracks. Unfortunately, without routine dental exams and cleanings, tooth decay can progress to the point that serious dental damage develops. When decay has already damaged tooth enamel, patients will need to undergo restorative dentistry treatment to rebuild the structure of the tooth. At Signature Smiles, our experienced dentists offer a range of dental treatments that can repair the damage caused by all stages of tooth decay for our Woodinville, WA patients. These treatments restore the health of the teeth and prevent more serious oral health complications, such as tooth loss. Tooth decay is a progressive condition. Unfortunately, this means that without intervention or treatment, decay will worsen until the entire tooth is damaged beyond repair. Stage 1: Healthy tooth enamel with plaque - The first sign of tooth decay is the presence of plaque. Plaque is a hard, sticky layer that builds up on the teeth when bacteria multiply. Because of how hard it is, plaque cannot easily be removed with regular brushing or flossing. Once plaque builds up, it can begin to eat away at healthy tooth enamel. However, if a patient undergoes regular dental cleanings at least twice a year, this plaque can be removed before it has a chance to destroy healthy tooth enamel. Stage 2: Decay in enamel - If plaque is not removed in a timely manner, it will destroy tooth enamel. Tooth enamel is the outermost layer of a tooth. When this top layer of the tooth is damaged, it is most commonly referred to as a cavity. A cavity is a like a small hole that allows bacteria to reach deeper layers of the tooth. This type of tooth decay is best treated with a dental filling, which replaces damaged tooth enamel and seals off the tooth to protect its inner layers. Stage 3: Decay in dentin - If a cavity goes untreated, bacteria can reach the layer of the tooth that lies beneath the enamel, which is the dentin. It is important to treat advanced stages of tooth decay because the dentin is the final layer of protection between bacteria and the pulp of the tooth, which is where the nerves and other sensitive tissues lie. Inlays and onlays may be able to repair cases of tooth decay that have damaged tooth dentin, but it is more likely that a patient will require a dental crown. 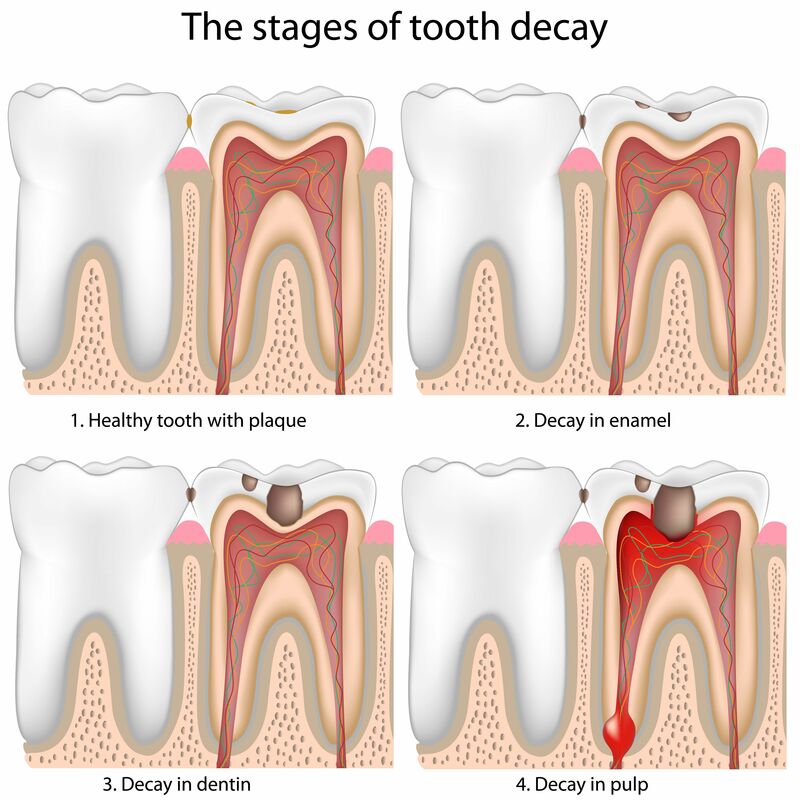 Stage 4: Decay in pulp - If decay damages the tooth enamel and dentin, the pulp of the tooth will be unprotected. Once bacteria reach the pulp of the tooth, they can cause a root canal infection. The only treatment for a root canal infection is root canal therapy. During root canal therapy, inflamed tissues and nerves from the center of the tooth are removed and replaced with a rubber-like compound. The tooth is then restored with a dental crown. Routine dental exams and cleanings are the best way to preserve oral health and prevent advanced stages of tooth decay. If you are due for a dental cleaning, schedule an appointment with one of the experienced dentists at Signature Smiles at your earliest convenience.